February has the most since October 2008. (AP Photo/Julie Jacobson) Construction of single-family homes nationally, which makes up roughly 70 percent of housing starts, dipped in February, to 457,000 after rising for four straight months to an 18-month high. A jump in volatile apartment construction offset the decline. U.S. builders started work on slightly fewer homes in February. But they began laying the ground work for a turnaround later this year by requesting the most building permits in any month since October 2008, a new report shows. In Utah, builders along the Wasatch Front took out in February 404 permits for the construction of new single-family homes, up more than 42 percent from 284 permits in February 2011, according to Construction Monitor, a service that tracks building activity throughout the West. Homebuilding activity along the Wasatch Front peaked in 2006 and early 2007 before plummeting as the housing bubble burst. In February 2006, builders took out permits for the construction of 1,092 homes, with permits falling to 905 in February 2007 and 269 in February 2008. Nationally, the Commerce Department said Tuesday that builders broke ground on a seasonally adjusted annual rate of 698,000 homes last month. That's down 1.1 percent from January's revised level of 706,000, the highest since October 2008. Building permits, a gauge of future construction, jumped 5.1 percent last month, to 717,000. Two-thirds are for single-family homes, which are critical to a housing recovery. It can take up to 12 months for a builder to obtain a permit and construct a single-family home. 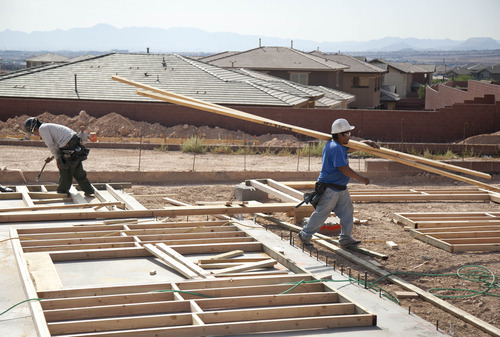 Ian Shepherdson, chief U.S. economist at High Frequency Economics, said he expects further gains over the next few months, based on a measure of builder confidence that has increased in five of the past six months. The housing market nationally and in Utah still has a long way to go before a full recovery is under way. The current pace of construction is barely half the rate considered healthy, as are the number of permits being requested. Most analysts say it could be years before the industry returns to full health. Construction of single-family homes nationally, which makes up roughly 70 percent of housing starts, dipped in February, to 457,000 after rising for four straight months to an 18-month high. A jump in volatile apartment construction offset the decline. A mild winter allowed builders to keep working in most parts of the country. And an improving job market has many slightly more optimistic about home sales this year. Mortgage rates are hovering near record lows below 4 percent. And home sales started to rise at the end of last year. Though new homes represent just 20 percent of the overall home market, they have an outsize impact on the economy. Each home built creates an average of three jobs for a year and generates about $90,000 in taxes, according to the National Association of Home Builders.